The Clumber Spaniel dog breed was originally created to find and retrieve game birds for hunters. Today, there is an effort to re-establish the Clumber Spaniel as an exceptional gundog, and many Clumber Spaniels compete in field trials. They can also be found in the show ring and competing in tracking, obedience, rally, and other dog sports. Last, but definitely not least, they make super family companions. See all Clumber Spaniel characteristics below! With his large head, low body, and substantial build, the Clumber Spaniel is often described as a dog who plods along with no great speed, agility, or energy, but that description doesn't do him justice. It's true that he's a slow worker, but he has power and endurance, as well as great enthusiasm. He comes alive when he hits bird scent and is painstakingly thorough in exploring it until he either finds his prey or decides to move on. He's a perfect choice for the hunter who wants to enjoy his sport at a relaxed pace with a dog who will stay close at hand. The Clumber works at a trot and is capable of going all day long at this pace. He wasn't bred to be a water retriever, but most Clumbers swim well and their heavy coat protects them from cold water. Those used as duck dogs don't have any problem breaking ice to retrieve their game. This medium-size dog is the heaviest of the spaniel breeds with a long body that helps him move through underbrush. (That long body also gives him a surprisingly far reach when it comes to food on kitchen counters.) He's characterized by a massive head, dark amber eyes, and a medium-length white coat with lemon or orange markings. Calm and sedate, the Clumber is a sweet and gentle dog who enjoys the company of his people. He bonds to the entire family but sometimes chooses one person as his special favorite. Nicknamed the "retired gentleman's spaniel," he's a good choice for first-time dog owners because of his easygoing temperament. The Clumber will adjust his activity level to your needs. His sporting heritage means he enjoys a good walk and can excel in the field or at a variety of dog sports, but he's also quite fond of hearth and home, especially if he can nap on top of your feet. The Clumber is playful and intelligent, mischievous and stubborn, dignified and charming. A whole host of such adjectives have been applied to this breed, but suffice it to say that he's a much-loved member of the family who thrives on attention. Children who play ball with him will find him to be a tireless friend. He's happy to occupy himself by carrying things around in his mouth, a habit he begins in earliest puppyhood and continues throughout his days. It's not unusual to see him wriggle his whole body as he greets someone, all the while with a favorite toy or other object in his mouth. The Clumber is not an easy-care dog, but neither does he require the same devotion to grooming as, say, a Poodle or Afghan Hound. He does shed, sometimes heavily, and needs daily brushing if you want to keep loose hair off your clothes and furniture. Nor is he recommended for the neat at heart. Clumber Spaniels shed, slobber, and track dirt into the house. If any type of mess bothers you, choose a different breed. Clumber Spaniels need daily exercise, which can be satisfied by one 20- or 30-minute walk or a 15- or 20-minute walk or playtime twice a day. While Clumbers make excellent walking companions, they're not suited to accompanying joggers. 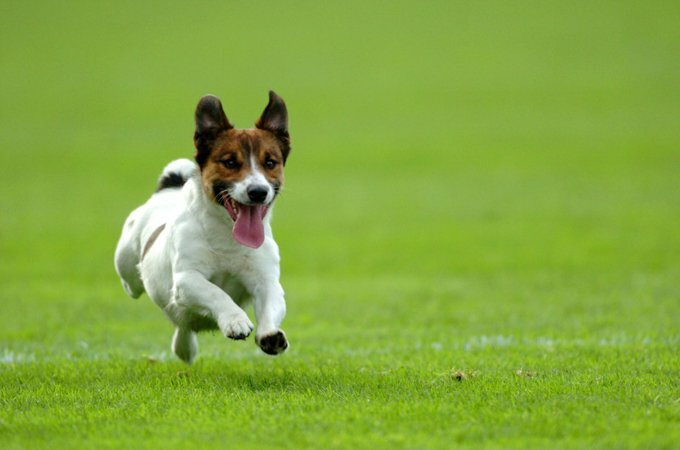 The breed has a high incidence of hip dysplasia, and jogging can put unnecessary strain on their joints. Training is fairly easy with this intelligent breed, although there are exceptions to every rule. In general, however, Clumbers respond well to praise and positive reinforcement in the form of food rewards or play. Their gentle dispositions can be easily damaged if they are corrected harshly. Instead, be fair and consistent in what you ask, and reward him every time you see him doing something you like. People who love Clumbers say that once you have one, you'll never want to be without one. Whether he's your hunting buddy or a family friend, the Clumber will return your affection and loyalty many times over — and will warm your feet as part of the bargain. Clumber Spaniels are rare and finding a breeder who has puppies may take time. Expect to spend time on a waiting list. Clumber Spaniels can be destructive whether through boredom or play. Their strong jaws allow them to demolish many household items with ease and they can destroy many so-called indestructible toys. It is important to take this into consideration before purchasing a Clumber and to take the time to dogproof your house. Clumber Spaniels are notorious counter surfers. They may be short, but their long bodies enable them to reach even the deepest of counter spaces. Clumbers can figure out how to break into refrigerators, cupboards, and drawers. Clumber Spaniels are not for neat freaks. They are heavy shedders and require daily grooming to keep their coats healthy and free of dead hair. Even then, you will find their hair in every part of the house. Clumber Spaniels are an excellent breed for first-time dog owners. They are generally an easy breed to care for and are only moderately stubborn. They have a sweet temperament, and their intelligence makes them a wonderful companion. Clumber Spaniels need 20 to 30 minutes of exercise daily, broken up into two or three short walks or a single walk. It is very important to maintain your Clumber Spaniel at a healthy weight to avoid stress on his joints. The breed has a high incidence of hip dysplasia and can become obese very easily. Clumber Spaniels do very well in apartments if their exercise needs are met. Clumber Spaniels generally do very well with children and other dogs and animals, but it is still important to properly socialize your puppy to prevent timidity. The romantic story behind the Clumber's origin is that the French Duc de Noailles shipped his entire kennel of spaniels to the Duke of Newcastle in England to save his prized dogs during the French Revolution. Little evidence has been found to support this story, however, and a 1788 painting of the Duke of Newcastle — a year before the French Revolution — depicts him with several white and lemon dogs who clearly have the look of today's Clumber. And the spaniels take their name from the Duke's estate, Clumber Park, in Nottingham. However they got there, the Duke's gamekeeper, William Mansell, is credited with shaping the breed as we know it today. The Clumber Park Spaniel was quite popular with noble hunters in the mid-19th century. They even had a royal fan in Edward, Prince of Wales (later Edward VII), who kept them at his Sandringham House estate. The first Clumber Spaniel was imported into North America in 1844 by a British officer, Lieutenant Venables, who was stationed in Nova Scotia, Canada. The first American Kennel Club registration of a Clumber Spaniel, Bustler, was in 1878, but the Clumber Spaniel Club of America wasn't founded until 1972. The Clumber is a rare breed, ranking 121st among the 155 breeds and varieties recognized by the AKC. Male Clumbers stand 18 to 20 inches at the shoulder and weigh 70 to 85 pounds; females are 17 to 19 inches and weigh 55 to 70 pounds. The Clumber personality ranges from reserved and dignified to "I love everyone." In the field they are quiet workers, and you will find them to be quiet at home as well. They will alert you to danger but aren't indiscriminate barkers. Although they have a reputation for being sweet and gentle, they can also be determined and self-willed. Spaniels like to get their way. And adolescent male Clumbers can be hooligans. They can become pushy and possessive if you don't establish your leadership early on. Be kind but firm with them, never harsh. That will only make them dig in their paws. Instead, establish clear rules and enforce them so your Clumber knows what you expect. Clumbers can develop bad habits such as counter surfing, fridge raiding, and chewing; in fact, they're sometimes referred to as Scavenger Spaniels. They'll steal food from little kids — they probably originated that saying about taking candy from a baby — so crate them while your child is eating. Remember, if they can reach a kitchen counter, they can reach your child's high chair. Correct these behaviors early — even if they make you laugh — before they become ingrained. Keep food and trash well out of reach, and put child locks on cabinets to keep your Clumber from breaking into the pantry. When you see him chewing on something he shouldn't, calmly take it away and replace it with a sturdy chew toy. Like every dog, the Clumber needs early socialization — exposure to many different people, sights, sounds, and experiences — when they're young. Socialization helps ensure that your Clumber puppy grows up to be a well-rounded dog. Clumbers are generally healthy, but like all breeds, they're prone to certain health conditions. Not all Clumbers will get any or all of these diseases, but it's important to be aware of them if you're considering this breed. In Clumbers, you should expect to see health clearances from the Orthopedic Foundation for Animals (OFA) for hip dysplasia (with a score of fair or better), elbow dysplasia, hypothyroidism, and von Willebrand's disease; from Auburn University for thrombopathia; and from the Canine Eye Registry Foundation (CERF) certifying that eyes are normal. You can confirm health clearances by checking the OFA web site (offa.org). Hip Dysplasia: This is a heritable condition in which the thighbone doesn't fit snugly into the hip joint. Some dogs show pain and lameness on one or both rear legs, but you may not notice any signs of discomfort in a dog with hip dysplasia. As the dog ages, arthritis can develop. X-ray screening for hip dysplasia is done by the Orthopedic Foundation for Animals or the University of Pennsylvania Hip Improvement Program. Dogs with hip dysplasia should not be bred. If you're buying a puppy, ask the breeder for proof that the parents have been tested for hip dysplasia and are free of problems. Hip dysplasia is hereditary, but it can also be triggered by environmental factors, such as letting a puppy gain too much weight too quickly or injuries incurred from jumping or falling on slick floors. Because of the breed's short stature, Clumber hips do not look normal compared to those of other breeds, so a veterinarian looking at their hip x-rays must take that into account. That said, Clumbers have a high incidence of hip dysplasia, so it's essential for them to maintain a healthy weight to avoid stressing their joints. Your Clumber is highly likely to have hip dysplasia, but if you don't let him get overweight it probably won't cause any serious problems. Chondroitin sulfate/glucosamine supplements can be useful in managing any discomfort from hip dysplasia. Hypothyroidism: Hypothyroidism is caused by a deficiency of thyroid hormone and may produce signs that include infertility, obesity, mental dullness, and lack of energy. The dog's fur may become coarse and brittle and begin to fall out, while the skin becomes tough and dark. It can be managed very well with a thyroid replacement pill daily. Medication must continue throughout the dog's life. Ectropion: This defect is the rolling out or sagging of the eyelid, usually the lower one, leaving the eye exposed and prone to irritation and infections such as conjunctivitis. Severe cases can be treated with surgery. Entropion: This defect, which is usually obvious by six months of age, causes the eyelid to roll inward, irritating or injuring the eyeball. One or both eyes can be affected. If your Clumber has entropion, you may notice him rubbing at his eyes. The condition can be corrected surgically, but wait until your Clumber is fully grown. Once his head finishes developing, at two to three years of age, the condition may correct on its own. Ear infections: Clumber Spaniels can be prone to ear infections because their floppy ears trap moisture. The warm, moist environment inside the ear is ideal for bacterial growth. Check ears regularly for signs of infection such as a bad odor, redness, or tenderness. The Clumber with an ear infection may also shake his head frequently or paw at it. Take him to your veterinarian for a diagnosis. Clumbers with frequent ear infections may have food allergies. Clumber Spaniels can do well in apartments or condos if their low to moderate exercise requirements of a 20- to 30-minute daily walk or playtime are met. That said, don't forget that they're essentially a large dog. If you live in a fifth-floor walkup, will you be able to carry your adult Clumber up and down the stairs when he gets sick or too old to climb them? It's something to think about. Generally, Clumbers are quiet and are not known as a breed that barks a lot. A fenced yard keeps them safe from loss or theft. Besides walks, Clumbers enjoy playing fetch. When they're puppies, however, it's important to restrict any running on hard surfaces or jumping on and off furniture or sliding around on slick floors and crashing into the wall. All of those activities can injure their still-developing joints. Your Clumber pup will chase a ball for as long as you'll let him, even if he's tired, so it's up to you to limit his activity. Give him a break after the fifth fetch or so. Crate training is a wonderful tool to help in house training, and a crate also provides a safe haven for your Clumber Spaniel when you are gone. Clumbers are known for their ability to get into things, even as adults, so this ensures that both your dog and your belongings are safe when you are away. Some Clumbers are prone to colitis, inflammation of the large bowel. If your Clumber has soft stools that contain spots of blood or mucus but otherwise appears healthy, he may have colitis. Put him on a 24-hour fast, make sure he has access to plenty of water, then give him bland meals such as chicken and rice for the next couple of days. Gradually reintroduce his normal diet. If colitis recurs frequently, ask your veterinarian about giving your Clumber a diet formulated for dogs with sensitive digestive systems. Recommended daily amount: 2 to 2.5 cups of high-quality dry food a day, divided into two meals. Puppies may eat as much as 4 to 6 cups a day. If you're unsure whether he's overweight, give him the hands-on test. Place your hands on his back, thumbs along the spine and the fingers spread downward. You should be able to feel but not see his ribs. If you can't feel the ribs, he needs less food and a longer walk. For more on feeding your Clumber, see our guidelines for buying the right food, feeding your puppy, and feeding your adult dog. 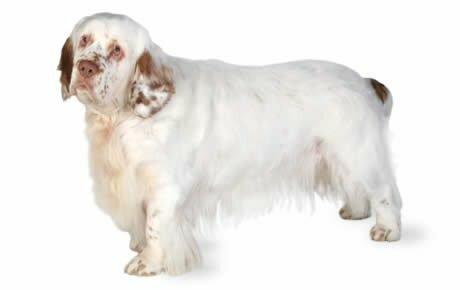 The Clumber Spaniel has a soft, medium-length coat that's thick and straight, lying flat on the body. The ears, legs, and belly have moderate feathering — a longer fringe of hair — and there's a frill below the neck, longer hair that's sometimes referred to as an apron. Clumbers are easy to prepare for the show ring because they're supposed to look natural, with no shaving or trimming except to tidy the feet, rear legs, and tail. Their bodies are primarily white, usually with lemon or orange markings around the eyes and on the head or ears. Sometimes they have freckles on their muzzle — the area of the head in front of the eyes — and on the legs, body, and at the base of the tail. Clumbers who will be show dogs should have as few markings on the body as possible, but freckles and markings on the body don't affect their ability to be a family friend. Clumber Spaniels are considered to be average to heavy shedders, and there will be days when it seems as if it's snowing Clumber hair in your home. Daily brushing is a must to keep loose hair to a minimum. Other than that, all you really need to do is trim the hair on their rear legs and tail and between the pads of the feet to keep them looking neat. Ask a breeder or groomer to show you how. A Clumber Spaniel's white coat can hold a significant amount of dirt and debris, so feel free to bathe him as often as you think necessary. As long as you're using a shampoo made for dogs, regular baths won't affect his coat except to make it look clean instead of dingy. Just be sure to rinse thoroughly to prevent itchiness from shampoo residue. Begin accustoming your Clumber to being brushed and examined when he's a puppy. Handle his paws frequently — dogs are touchy about their feet — and look inside his mouth and ears. Make grooming a positive experience filled with praise and rewards, and you'll lay the groundwork for easy veterinary exams and other handling when he's an adult. As you groom, check for sores, rashes, or signs of infection such as redness, tenderness, or inflammation on the skin, in the ears, nose, mouth, and eyes, and on the feet. Your careful weekly exam will help you spot potential health problems early. The Clumber Spaniel is prone to ear infections, so preventive care is important. This can be as simple as drying your dog's ears after swimming and checking the ears regularly for signs of infection such as a bad smell, redness, or tenderness. The Clumber with an ear infection may also shake his head frequently or scratch at his ears. Gently wipe out the ear — only the part you can see — with a cotton ball moistened with a cleaning solution recommended by your veterinarian. Never stick cotton swabs or anything else into the ear canal or you might damage it. Brush your Clumber's teeth at least two or three times a week to remove tartar buildup and the bacteria that lurk inside it. Daily brushing is even better if you want to prevent gum disease and bad breath. Trim nails regularly if your dog doesn't wear them down naturally. If you can hear them clicking on the floor, they're too long. Short, neatly trimmed nails keep your legs from getting scratched when your Clumber enthusiastically jumps up to greet you. It's been said that Clumbers and kids go together like ice cream and cake. Clumbers generally love kids, especially kids who throw a ball for them to fetch. They are usually protective of children in the family and are more likely to walk away than to snap or growl if they're getting unwanted attention from a child. If your Clumber puppy is raised with your toddler, you'll probably see a beautiful friendship blossom. The toddler may accidentally get flattened once in a while by an exuberant young Clumber, but he'll be licked until he's back on his feet. Nonetheless, dogs are individuals, just like people. Not every Clumber who is raised with kids will take to them, especially if the kids are poorly behaved. Adult Clumbers who haven't been brought up with kids may do best in families with older children who understand how to interact with dogs. Some Clumbers may be reticent around children they don't know, and like most dogs, they don't like being charged by tiny toddlers — or anyone else. Protect your dog from these assaults, and teach the children you encounter how to approach a dog safely. Always supervise any interactions between dogs and young children to prevent any biting or ear or tail pulling on the part of either party. Teach your child never to approach any dog while he's eating or to try to take the dog's food away. No dog should ever be left unsupervised with a child. Clumber Spaniels also do very well with other dogs and animals, especially if they are raised with them. They are birdy, however, and you should protect pet birds until you're sure your Clumber understands they're off-limits. Some spaniels can learn that fact, if they're taught from puppyhood, but don't assume that it will happen with every dog. You may always need to keep the two separated, if only so your Clumber doesn't pull your parakeet's tail or your parrot won't take a bite out of your Clumber's sensitive nose. Clumbers are often purchased without any clear understanding of what goes into owning one. There are many Clumbers in need of adoption and or fostering. There are a number of rescues that we have not listed. If you don't see a rescue listed for your area, contact the national breed club or a local breed club and they can point you toward a Clumber rescue.